KNOTS, display & public program, ODD, May 2016. Photo by Petre Fall. Cristina Bogdan runs ODD, an initiative in Bucharest concerned with catalyzing the local imagination via practices related to art, research, science, technology and politics. It is a space, not always with a physical correspondent, for social gatherings of all kinds. During her one-month residency in Barcelona, Cristina inquired into local forms of organization in the cultural field, with a specific focus on hybrid, under the radar initiatives which may camouflage as art for various reasons. She also tried to get a better grasp on the political context and the role played by the grassroots movement in recent events. Her public presentation with BAR will consist of an overview of the Bucharest context and the practice of ODD, in relation to her findings in Barcelona. It immediately opens to dialogue with all those who are interested in exchanging methods and ideas about modes of operating as small groups in times when solidarity is crucial. At 7pm there will be guided tour at Belén Zahera exhibition “A good day for palmistry” by the curator Rosa Lleó. Following, at 7.30pm, Cristina Bogdan will do her public presentation. In 2014, she founded ODD (oddweb.org), a space for meetings and artistic production in Bucharest. She is also the founder and editor of Revista ARTA online (revistaarta.ro), a platform mapping contemporary art in Romania. Independent curator and researcher based in Tangier. Since November 2016, she is the founder and artistic director of Mahal, an interdisciplinary art space for research on contemporary practices in Tangier. that occurred differently in this three countries, she analyses their links and the influence they have had in their artistic evolution since the 20th Century to these days, in order to create a theoretical and critical framework. Nouha Ben Yebdri is also a member of Madrassa, a curatorial collective that envisions exhibition making as a research and critical endeavour, by experimenting and investigating collective practices and transborder collaborations. Has developed a work on the border between the academic traditions of modern Paraguayan art and contemporary and popular expressions; He has a profuse production of engraving, and some of his works dialogue with the popular art of Paraguay, combining traditional materials and techniques with new technology. He has exhibited regularly on an individual basis since 1995, and has participated in collective and biennial exhibitions. She is a member of the Ediciones de la Ura collective and has participated in the Espacio / Crítica Seminar. He is the founder and coordinator of the Cabichu’i Engraving Workshop. In 2016, he was selected as artist in residence of Genealogies: Puerto Casado, coordinated by Valentina Bonifacio as a joint project of Parsons New School, New York, Ca’Foscari University of Venice and the CAV / Asunción Mud Museum. Artistic production is profoundly influenced by mysticism notions. In her artistic work she builts new stories from collecting other people memories. Based on the exploration of graphology, palmistry, astrology, numerology, the use of the pendulum and oracles as the I-ching, which she use as tolos, is that her work proposes other way to signify experiences. She has attended workshops and seminars on Contemporary Art Theory and Philosophical studies related to this medium. Exhibited individually and collectively in Diego Rivera Anahuacalli Museum in Mexico City, Museum of Painters in Oaxaca, Zapopan Art Museum (MAZ), Museum of the City of Guadalajara, Forum for Art and Culture, Ex Convento del Carmen, Cultural Modern Art Center, Sala Juarez, TRAMA Center, Museum-Studio Clemente Orozco, among others. As the conclusion of her residency, Nouha Ben Yebdri, independent curator, founder and director of Mahal Art Space, an alternative art space dedicated to contemporary art in Tangier, ofers a screening session of the most incipient films of the French-Moroccan artist Randa Maroufi. Randa Maroufi (1987) produces, after passing through Le Fresnoy – Studio national des arts contemporains, two films: La grande Safae and Le Park, both awarded at different international festivals, and screened in different alternative cinemas and museums. Before turning thirty, she adds to her portentous career another video, Stand-by Office, made during a residency in Amsterdam. In September 2017, she is a resident artist for one year at Casa Velázquez, in Madrid, where she continues with the research of Bab Sebta (Ceuta’s Gate), a project in which she works with video, photography, drawings and installations, around the economic system created on the border between Morocco and Ceuta. The film La grande Safae is a free interpretation of a character known as the great Safae. Transvestite, she spends part of her life as an employee in a house, in which she lived with constant rumors and legends about her gender. Le Park proposes a slow walk in an abandoned amusement park in the center of Casablanca (Morocco). The film presents the portrait of young people who frequent this place, and creates a staging of moments of their lives in it, meticulously composed and often inspired by images found on social networks. In Stand-by Office, a group of people is presented in an administrative building. We can observe that a series of routine gestures happen: the person in the reception attends and answer calls, another organizes documents and files, others are preparing a meeting… Little by little, unexpected situations occur, taking the viewer to an unsuspected place. Playing with the viewer’s perception, with subtlety and always on the borderline between fiction and reality, through her films, Maroufi opens the discussion on youth, gender and immigration, themes and contemporary questions, extrapolative to everyday life both in the Maghreb and in many European countries. Nouha Ben Yebdri residency is a collaboration with Aria Projects. “An organism is not the environment it represents. We who are alive are indebted to our ancestors who are dead and who are no longer here. We do things that we know, by virtue of future goals, are not present. All these sorts of phenomena of absence are very important.” — Eduardo Kohn. Phenomena of Absence reveals four anthropomorphic methodologies – from archaeology to journalism, curating and art – for approaching the unrealistic: that which verifies the corporeality of the absent body. Based on oral and visual sources and on data about ancestors, our own neighbours and society in general, the artworks and arrangements highlight a physical, cognitive and organizational analysis. David Ortiz Juan works on the idea of the phantom as a social figure in relation to the history of Spain and those who disappeared during the civil war; Elida Høeg focuses on issues that have to do with the loss of privileges in the public spaces of cities, with a special interest on sound and noise; Hugo Hemmi returns to his origins to interview his grandmother, a daughter of Spanish emigrants to France, and to try to learn more about a story almost always hidden and barely revealed; and Rosanna del Solar proposes an essay on the importance of documenting stories, in this case relating the Soviet context to the Peruvian context, looking for similarities and differences in the historical construction of both countries in relation to the transition from dictatorship to democracy. 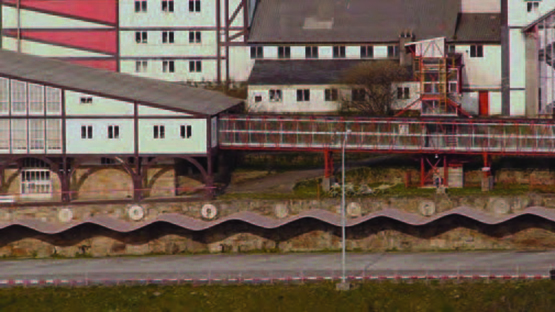 This exhibition study presents the projects that David Ortiz Juan, Elida Høeg, Rosanna del Solar and Hugo Hemmi have developed throughout the practical training programme BAR TOOL #1. BAR project launch the open call to participate in the second edition of the practice-based training program BAR TOOL#2, taking place in Barcelona from October 2nd, 2018 through June 30th, 2019. BAR TOOL#2 is a 9-month practice-based training program in which 10 fellows enrol. The program is addressed to participants from various fields of knowledge – art and non-art related practices. BAR TOOL#2 fellows will be followed up by mentors and tutors and provided with working space at Fabra i Coats and Tapies Foundation in order to facilitate and support their practices. Landing: During the first months, the fellows activities will focus on tutoring sessions, meetings with BAR project residents, and exploring the city through walks and visits to different projects, institutions and galleries. Working with Barcelona: From November to March the program offers three weeks of intensive work open to other participants (BAR MODULE) that generate learning spaces through different themes and dynamics, bringing together local, national and international guests. Public essay: during the whole year the fellows will have the possibility to “rehearse” on public presentation, showing their work at different moments, spaces and contexts. Presentation: During May and June the participants will focus on the production and presentation of a final project. The mentors and the invited tutors will follow up on fellows’ activities during the whole program, as well as they will organize group meetings and reviews, tutorials, and studio visits. The program will explore a range of subjects this year, revolving around the interests and concerns of a number of invited artists, writers, activists, scholars, and curators. A public program, open to the participants but also the public at large, will consist of lectures, seminars, and workshops. BAR TOOL #0 + #1 past editions 2016-18 guests have been Carles Guerra, Angel Calvo Ulloa, Aimar Arriola, Aimar Pérez Galí, Jordi Ferreiro, Osías Yanov, Nuria Güell, Emily Pethick, Susan Gibb, Philippe Pirotte, Vivian Sky Rehberg, Inés Katzenstein, Summer Guthery, Helmut Batista, Daniel Blanga-Gubbay, Karima Boudou, Santiago Villanueva, Dorothée Dupuis, Alfredo Aracil, Eva Rowson, Leire Vergara, Gelen Jeleton, Erick Beltrán, Antoni Hervás, Equipo Palomar, Montserrat Rodríguez, Ignasi Aballí, Emma Haugh, Suza Husse, Oriol Vilanova, Valeria Graziano, Sofia Dourron, Pablo Martínez, Mario García Torres, Dora García. BAR project team tutors: Veronica Valentini, Andrea Rodriguez, Juan Canela. BAR TOOL is a practice-based training program articulated around research, production and presentation processes. Deepening on cross-disciplinary thinking and acting, the program is addressed to participants from various fields of knowledge – art and non-art related practices. Over nine months a hosting environment is encouraged, in which the flow of knowledge will happen through conversation and action, within generational and epistemological convergence. The program focus on providing a context for an intensive professional exchange through practical discussions and theoretical workshops with local and international mentors and a tailor-made list of guests, visits and encounters according with participants interests. For this edition of BAR TOOL, ten fellows are selected by BAR project team through an open call for applications. Candidates are considered on merit, as well as the overall response of their applications within the mission and context of BAR TOOL. The admissions committee shortlists an initial group of candidates for Skype interviews on Tuesday 10 and Wednesday 11 July. BAR TOOL #2 is open to participants from various fields of knowledge – art and non-art related practices, willing to deepening in knowledge and practice through visual arts. For those with no previous experience into arts, a draft for a project to be developed during the year, included in the motivation letter, would serve as a sample on how their approach to it could be pertinent enough. – Have completed an undergraduate degree or have equivalent experience. – Be available to commit full-time to BAR TOOL’s assigned schedule for the year, which means moving to Barcelona. Other engagements must be kept at an absolute minimum and should not interfere with the participant’s commitment to the program. – BAR TOOL is open to Spanish and international applicants. – Due to the international scope of BAR TOOL program, the working language is English. – Mentoring and tutoring by local, national and international guests, together with the follow up of BAR project team. – Three intensive working weeks of workshops, lectures and presentations on subjects driven by relevant guest tutors. – Working space at Fundació Antoni Tàpies and/or Fabra i Coats – Creation Factory IF NECESSARY and subject to conditions of regular use. – Technical equipment supported by Hangar. – Participation in different public presentations. – Production and presentation of a final project. Fellows are expected to cover travel, living, health insurance or visa costs and any other expenses non stated above, and are encouraged to secure sources of funding to support the latest. The deadline for submissions is midnight (GTM+1), Friday, the 20th of July, 2018. Applications received after this date will not be considered. You will not receive a confirmation email for your entry. Skype interviews will happen on July 23th, and acceptance to the program will be confirmed to the applicants via email by 25th July 2018 and the list of participants will be made public shortly after. The deadline for submissions is midnight (GTM+1), Sunday, the 7th of July, 2018. Applications received after this date will not be considered. You will not receive a confirmation email for your entry. Acceptance to the program will be confirmed to the applicants via email by 13th July 2018 and the list of participants will be made public shortly after. It is about seeing forces in action through different registers: what happens during the translation between word, image, rhythm and movement. It is about observing if this exercise allows us to think about non-binary relationships between fragility and power. According to artist Erick Beltrán, an image is created from the distribution of forces through a given space and that is why an image is an ideological device. And we could add: that is why it is choreographic. In this conference I show one or two ideas that were formulated when analyzing bodies in movement, and two or three ideas that emerged from the dance floor and with which I built Hegelian Dancers, a danceable lecture that has become for me a way of thinking about curating: the relationship between the body and ideas. During the conference I show also one or two examples of how I try to affect the body and how the body is present in some curatorial projects that I have developed in order to try to generate other sensitive/cognitive mechanisms. During my residency at BAR project I interviewed drummer Uriel Barthélémi to perceive if through sensory terms the difference between binary and non-binary rythms, and how this different sounds can affect the body. I also discussed the materials I usually use for Hegelian Dancers with dancers Mar Medina and Aimar Pérez Galí and with artist Erick Beltrán. It is a small collection of stories in which one does not distinguish very well which character is the strong one and which is the weak one. I asked them to help me identify the vectors of forces present in the stories in order to create diagrams and movements that explain the relationship between a strong-weak and a weak-strong body or force. The party will begin with Erick Beltrán and his selection of cumbias reduced. And then, let´s see. Emily Pethick will present The Showroom, a contemporary art space in London that focuses on collaborative and process-based approaches, as well as on cultural production inside and outside its locality, linking experimental artistic practice with a variety of communities of interest and political concerns. Susan Gibb will introduce the work of If I Can’t Dance, I Don’t Want To Be Part Of Your Revolution, a curatorial production house based in Amsterdam, The Netherlands, which explores the evolution and typology of performance and performativity in contemporary art. If I Can’t Dance develops and produces projects and thematic programmes with artists, curators, and researchers on the basis of long-term collaboration, and present these through a network of partner institutions and venues in the Netherlands and abroad. Through this mode of working, projects are developed through their very enactment, at each event, and each location, over time. Drawing on examples of If I Can’t Dance commissions, the talk will consider what it means to curate via production, and to consider ‘liveness’ from the perspective of ‘presentness’. With Good intentions are not enough Nuria Guell will critically analyze some of the political projects that Nuria Güell has carried out over the last few years, addressing both the inherent contradictions of these practices and their possibilities of impacting and affecting the real; devoting special attention to ethical issues -not moral- and to the thin line that separates ethics of consequences from ethics of intentions. Philippe Pirotte will discuss Jakarta Biennale within the context of a long related history of art and activism in Indonesia. One Must be an Owl as Regards Experience by Vivian Sky Rehberg will be a seminar grapple with the theories of creativity and experience that emerge from Marion Milner (1900-1988) writings and encourage speculation around their possible value for thinking about and writing about contemporary art. Over the course of her long life, British author and psychoanalyst , who published her best known book A Life of One’s Own (1934) under the pseudonym Joanna Field, used the diary form to develop a singular method of introspective analysis of her daily activities, occurrences, observations, thoughts, and interactions. Her prose, at once deeply personal and clinically dispassionate, is cleaved to her thinking processes, a mixture of free-association and keen, quasi-objective insights influenced by her psychological training. In his workshop Daniel Steegmann Mangrané will investigate how art can reconfigure our relationship with reality. From the intertwining between viewer and work, the importance of the phenomenological experience, the collapse of binary divisions and the ontological reformulation that this implies, the emergence of new subjectivities or the ecological crisis that we live and the interdependencies that are revealing, he will propose to analyze some of the different possibilities of involvement that are open to us. Always remembering that the important thing is not what happens inside the museum, but what happens to us when we face reality again. The project takes place in the duration of an hour, around a remote fountain in Passeig de Santa Madrona on Montjuïc. A local network is set up on site, which has a chatroom and an archive for digital files, which people will access from their devices. Referring to the method called Round robin, the chatroom will be used for a real-time, anonymous deliberation and debate with the fountain as conceptual, historical and physical center, guided by a text performance (by me). Everyone is asked in advance not to communicate orally during the session. The project includes contributions by other, Barcelona based artists on the topic Ressurection/Gathering. Sitespecifically or otherwise. The session ends when the fountain is shut off at 8pm. Thematically my interest goes to (internet) forum culture and the ways it effects other spheres of our existence, beyond the digital. I think of the project as a way of channeling specifics from the history of the site: both the figure of Santa Madrona, the political history, and the patterns of collective behaviour in the space. I’ve tried to combine these interests into the theme Ressurection/Gathering, reflects on how histories repeat, with an emphasis on intuition, premonition, an alternative knowledges. Ressurection to me stands for a need for an altered state of something already passed, in this case a reflection on the potential of the digital without corporate interference. Gathering refers of course to being together, coming together or collecting materials. Together they, by association, describe an activity of sorts, a ritual. Another level of research on site has been the social interaction that already exist around the fountain. Single men appear to be waiting, silently standing around in the bushes. They check their phones, write something, pace a little, then wait. The only conclusion I can draw from this is that it is some kind of cruising site perhaps. What interests me immensely with this is that there is an interaction in this space between these men that exists without spoken words, but in the digital. To honour this code, and to explore what it does to our social interaction, I want people to refrain from speaking while still being in the same, rather intimate space, for a whole hour. My interest is in the act of being together as bodies in space and as a collective, digital consciousness at the same time. Everyone remains anonymous on the chatroom, disconnecting us from physical markers of individuality, to some extent. The focus or ‘question’ on site is the fountain itself, and the conversation and contributions happen in the chatroom and in the archive. Through the hour we try to engage with the fountain as such a ‘question’. How do we derive at a conclusion from a question that is a material, a movement and a place in history? What kind of conclusion would it be and how can it be expressed? I want to explore group thinking that is not compatible with end-result thinking, the image of which is the fountain with it’s endless circulation of water for no clearly definable purpose beyond it’s signification. The word Reveries also refer loosely to this. A round-robin story, or simply “round robin,” is a type of collaborative fiction or storytelling in which a number of authors write chapters of a novel or pieces of a story, in rounds. Roundrobin novels were invented in the 19th century, and later became a tradition particularly in science fiction. In modern usage, the term often applies to collaborative fan fiction, particularly on the Internet, though it can also refer to friends or family telling stories at a sleepover, around a campfire, etc. Round-robin is a document signed by multiple parties in a circle to make it more difficult to determine the order in which it was signed, thus preventing a ringleader from being identified. Long before those contemporary meanings were known of, the term Round Robin had been used to refer to a variety of things. The earliest use was as a disparaging nickname, along the lines of ‘sly dog’ or ‘dark horse’. A round robin network, or wireless mesh network (WMN) is a communications network made up of radio nodes organized in a mesh topology. It is also a form of wireless ad hoc network. The reference to the site as the “other magic fountain” establishes a relationship between the one at Passeig de Santa Madrona, and the famous Magic Fountain of Montjuïc. By labelling it “other” there is a hierarchy in place on this site, which is not spoken but clearly exists. The two fountains exemplifies this hierarchy of significance and visibility beautifully I think. This to me, the gesture of making this relation clear through language puts in place an insistence on the validity and charm of the smaller fountain, while pointing to radically different world views, points in the history of Barcelona, and ways of relating to the world around us. The project takes place in the duration of an hour, around a remote fountain in Passeig de Santa Madrona on Montjuïc. A local network is set up on site, which has a chatroom and an archive for digital files, which people will access from their devices. Referring to the method called Round robin, the chatroom will be used for a real-time, anonymous deliberation and debate with the fountain as conceptual, historical and physical center, guided by a text performance. Everyone is asked in advance not to communicate orally during the session. The project includes contributions by other, Barcelona based artists on the topic Ressurection/Gathering. Sitespecifically or otherwise. The session ends when the fountain is shut off at 8pm. Thematically, Hagen’s interest goes to (internet)forum culture and the ways it effects other spheres of our existence, beyond the digital. She thinks of the project as a way of channeling specifics from the history of the site: both the figure of Santa Madrona, the political history, and the patterns of collective behaviour in the space. Hagen has tried to combine these interests into the theme Ressurection/Gathering, reflects on how histories repeat, with an emphasis on intuition, premonition, an alternative knowledges. To her, ressurection stands for a need for an altered state of something already passed, in this case a reflection on the potential of the digital without corporate interference. Gathering refers of course to being together, coming together or collecting materials. Together they, by association, describe an activity of sorts, a ritual. Another level of research on site has been the social interaction that already exist around the fountain. Single men appear to be waiting, silently standing around in the bushes. They check their phones, write something, pace a little, then wait. The only conclusion she can draw from this is that it is some kind of cruising site perhaps. What interests her immensely with this is that there is an interaction in this space between these men that exists without spoken words, but in the digital. To honour this code, and to explore what it does to our social interaction, I want people to refrain from speaking while still being in the same, rather intimate space, for a whole hour. Hagen’s interest is in the act of being together as bodies in space and as a collective, digital consciousness at the same time. Everyone remains anonymous on the chatroom, disconnecting us from physical markers of individuality, to some extent. The focus or ‘question’ on site is the fountain itself, and the conversation and contributions happen in the chatroom and in the archive. Through the hour we try to engage with the fountain as such a ‘question’. How do we derive at a conclusion from a question that is a material, a movement and a place in history? What kind of conclusion would it be and how can it be expressed? I want to explore group thinking that is not compatible with end-result thinking, the image of which is the fountain with it’s endless circulation of water for no clearly definable purpose beyond it’s signification. The word Reveries also refer loosely to this. The reference to the site as the “other magic fountain” establishes a relationship between the one at Passeig de Santa Madrona, and the famous Magic Fountain of Montjuïc. By labelling it “other” there is a hierarchy in place on this site, which is not spoken but clearly exists. The two fountains exemplifies this hierarchy of significance and visibility beautifully I think. This to the artist, the gesture of making this relation clear through language puts in place an insistence on the validity and charm of the smaller fountain, while pointing to radically different world views, points in the history of Barcelona, and ways of relating to the world around us. A public conversation among the director of Terremoto art magazine (MX) Dorothée Dupuis, the director of Instituto Torcuato di Tella de Buenos Aires, Inés Katzenstein and the artist Gelen Jeleton. Dorothée Dupuis (1980, Paris) curator and editor. Her practice focuses mainly on the intersection of the arts and politics, influenced by feminist, Marxist and postcolonial theories. Dupuis is Terremoto.mx magazine founder, based in Mexico City, where she currently works as director and editor. She is also co-director of the feminist magazine Petunia with Lili Reynaud Dewar and Valérie Chartrain. Inés Katzenstein Director founder of Art Department of Torcuato Di Tella University. She received a master’s degree from the Center for Curatorial Studies, Bard College, New York (2001), where she studied with an Antorchas Foundation and the National Fund for the Arts grant. She wrote extensively on contemporary art and curated exhibitions such as “Liliana Porter: Photography and Fiction” (Centro Cultural Recoleta, Buenos Aires, 2003), “David Lamelas, Foreigner, Foreigner, Ètranger, Aüslander” (Museo Rufino Tamayo, Mexico, 2005) and co-curated “Televisión, El Di Tella and an episode in the life of TV” (Espaço Telefónica, 2010), among others. She is part of the Advisory Board of Otra Parte de Artes y Letras magazine, and of the Advisory Council of Museo Malba. Gelen Jeleton (Murcia, 1975) developes her artistic practice with Jesús Arpal Moya in Equipo Jeleton since 1999. She studied Fine Arts in the University of Cuenca and graduated in the Department of Drawing of the Faculty of Fine Arts in Barcelona in Symbolism Renaissance and Alchemy. She moves this knowledges implementing them to her doctoral thesis project Una Archiva del DIY: self publishing and self management in a fanzinoteca feminist-queer, presented in Murcia in February 2016. * Jeleton is a team to operate in iconographic, literary, musical repertoires. To propose self-taught practices and the publication of provisional results for the debate. To take the authorship to inexperience situations, humor, appropriation. To disperse the results in space, time and distribution channels, making it difficult to deactivate them by the presentation context. Manifestaciones Públicas de Afecto is a digital publication that reclaims the importance of incorporating an affective dimension to the public sphere that psychoanalysis and feminism have historically made; investigating its possibilities to function as a space of resistance against the policies of neoliberal subjectivation. Avoiding idealizations and recognizing that affects can also have a normalizing function, the publication brings together texts and visual interventions by artists and researchers in whose practice the affective experience emerges as the basis of critical analysis: Valentina Desideri, Andrea Francke, Valeria Graziano, Gelen Jeleton, Mathew de Kersaint Giraudeau, Esther Planas and Florencia Portocarrero. Manifestaciones Públicas de Afecto has been edited and produced by Florencia Portocarrero in collaboration with Verónica Valentini, Juan Canela and Andrea Rodríguez Novoa (the BAR project team) as a result of The Right to Be Unhappy: on the politics of control of human behaviour and psychotropification of society; the Bar project spring residence program during 2016. 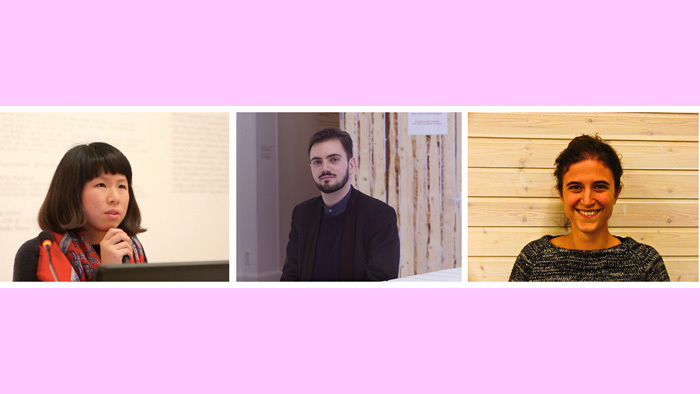 Visiting curators Summer Guthery (JOAN, Los Angeles) and Alfredo Aracil (Sala de Arte Joven 2017, Madrid) will talk about their curatorial practice and on-going projects. Summer Guthery is a curator and writer based in Los Angeles. She is the founder and director of non-for-profit exhibition space, JOAN, she was curator in LAXART and Performa Bienal 2013 and 2011 curator assistant. She’s Crysler co-founder, a serie of lectures, projections and actions in an office of Chrysler Street in New York. In 2014, was selected curator in residency in Disjecta Art Center in Portland, Oregon, programming exhibitions and acts for 9 months.She received her MA in Curatorial Studies from Bard College’s CCS. Guthery is a regular contributor to Frieze and Artforum amongst other publications. Alfredo Aracil is curator at Sala de Arte Joven de Madrid 2017 with the project “Apuntes para una psiquiatría destructiva (Notes for a destructive psychiatry)” which questions production mechanisms of mental disorders, as well as institutions and clinical methods involved in health management. He has collaborated with magazine Nosotros, El cuaderno, Tendencias, LUMIÈRE and now is writing for Atlántica XII and El Estado Mental. BAR module is an intensive working week which aim to create learning opportunities from different topics and dynamics. As part of BAR TOOL#0 Training Program 2016-2017, the two BAR module sessions, that focus on the politics of control of human behaviour and public programming practice, will be opened to a larger public. Besides of lectures, cconversations and workshops, a selection of guided tours to a comercial spaces, institutionals and independents (The Walking Tour), just as meetings and studio visits with local agents in the city of Barcelona. The city of Barcelona, Fabra i Coats Art Factory and Tapies Foundation. The symposium (in ancient Greece, the symposium meant “to drink together”) will consist in an intensive week of working groups, roundtables, actions, my studio visit, walking tour and performance to celebrate and reflect on the past and future practice of public programming of BAR project 2013-2017 together with other invited practitioners. Invited guests include Eva Rowson (Showroom, Londres), Pablo Martínez (MACBA, Barcelona), Santiago Villanueva (Mamba, Buenos Aires), Leire Vergara (Bulegoa, Bilbao), Helmut Batista (capacete, Rio de Janeiro), Elise Lammer (SALTS, Basel), Daniel Blanga-Gubbay (Aleppo, Bruselas), Karima Boudou (Appartement22, Rabat), El Palomar (artistas, Barcelona), Kroot Juurak & Alex Bailey (performer, Wien), BAR spring residents: Valerio Del Baglivo (curator, Roma), Daisuke Kosugi & Ina Hagen (artists & founders of Louise Dany, Oslo). BAR TOOL #0, the new pedagogical program by BAR project, will be host at Fundació Antoni Tàpies as part of the collaboration as resident project. BAR project is collaborating with Institut Kunst HGK hosting one student a summer in the city of Barcelona. True, the summer is the time when the city does not work, but, also true in this time of the year the more informal energies allow for the most. Why summer? Are we not going to be „cooked“ by the sun? Indeed, and also gain the possibility of experiencing a place in its peak of tourist, in a very special moment of its city use. Summer, as well, is full of opportunities that entangle leisure with art production. This is a residency not to do more, but to allow the artists to transit, to think, to see, to get to know. Relaxation is an integral part of thinking, why not to create the possibility of a summer around it. First student in resident is Yanik Soland (1990), an artist and musician based in Basel. His work has two basic traits: research and humor. With those he tries to understand the development of society, culture and art. Lately he’s very interested in collaborative work and the resulting potential of partially losing control of esthetics and content. During the last years he went on tour with several music projects and played in Italy, Serbia, Japan, Germany, Austria, Switzerland, Croatia, Slovenia and Hungary. The GB11 “Biennale Fellows” consist of roughly one hundred small-and medium-scale art organizations across the world, whose work makes important contributions to the art of today, yet remains under the radar. In a two-day forum (2-4 September), Biennale Fellows, as well as their peers and colleagues, are invited to come together, share experiences and discuss the future of this kind of work, especially with regards to questions of value, continuity and scale. Distinct from bigger-scale art organizations such as museums, art fairs, and biennials, organizations like us often function as the research and development department of the art world. Above all, we actively support artists to experiment and cultivate their practices and nurture contact and conflict zones around themselves. Yet the significance of our work is not fully acknowledged in a wider ecology, while our self-determined “marginal” or “minor” positions, as well as increasing precarity in the climate of austerity and various crises, are palpable. As Biennale Fellows, along with more than 100 other fellows, we place art center stage and create a platform to discuss specific values that our work embodies, as well as imagine acts that we can perform in common. The Forum will be one such concrete moment in which you all are welcome to join. Thanks to Employ Culture grant the initiative that creates jobs in the cultural sector by Santander Fundation we are pleased to announce that Gloria Fernández is the new BAR project coordinator. Gloria Fernández is an educator and coordinator of educational and artistic projects. She studied Fine Arts at the Universitat de Barcelona, specializing in arts education, and thenceforth she collaborated with different institutions as MACBA, Fundació La Caixa, Espai Cultural Caja Madrid, Musée Mobile (MuMo) or Liminal Gr in conducting and/or coordinating several projects. In between she studied a Master’s degree in Design and Management of Exhibition Projects (ELISAVA) and shortly afterwards she coordinated Arts Libris, the International Fair of Contemporary Edition of Barcelona. She is interested in cultural mediation and transmission of contents used by contemporary art as well as the interaction of artistic structures with the public user of these. BAR project fall session residents, Sojung Jun / Jungju An (Corea), Cristina Ochoa (Mexico – Colombia) and Mónica Restrepo Herrera (Colombia) continue developing the curatorial program for 2016, reflecting from different perspectives the politics of control of human behavior. In collaboration with Fundación Nefkens, SOMA Mexico – AC/E, y EMMA. An eight months practice-based training program. Study period at Fundació Antoni Tàpies and Fabra i Coats – Creation Factory, Barcelona from November 2016 until June 2017. The Future Generation Art Prize is a worldwide contemporary art prize to discover, recognize and give long-term support to a future generation of artists. The last edition of the prize in 2014 received over 4,000 applications from over 130 countries, and its 21 shortlisted artists participated in a special exhibition in Kiev. The winners were Nástio Mosquito (Angola) and Carlos Motta (Columbia), who split the $100.000 prize. The exhibition included 21 finalists, among whom were Neïl Beloufa (France), Cally Spooner (UK), GCC (Arabian Gulf Region), Ximena Garrido-Lecca (Peru), Kudzani Chiurai (Zimbabwe), and Cécile B. Evans (USA/Belgium). After the great success of the third edition, we are pleased to launch the fourth edition of the prize, which will culminate with an exhibition of the shortlisted artists in Kiev in February 2017 and in Venice, Italy, in conjunction with the 57th Venice Biennale in May 2017. Artists around the world under the age of 35 may enter the competition through an open call online application available in ten languages and open for three months online: Mid-June – September 2016. After the application period, the Selection Committee will shortlist twenty artists for an exhibition at the PinchukArtCentre in Kiev, which will be judged by an International Jury. The Jury will then award one main prize of $100,000. In the context of BAR project curatorial program, which explores during 2016 the politics of control of human behavior, artists Valentina Desideri (IT/NL) and Warren Neidich (US/D), and curator Florencia Portocarrero (PE), in residence until the end of May, will be presenting their work and introducing the projects they are developing in Barcelona. These projects and researches will be partially shown at “The Right to be Unhappy” event, taking place at French Institut and Antoni Tàpies Foundation respectively on 6th and 7th of May. Warren Neidich is an artist, writer and organizer who is founding director of the Saas-Fee Summer Institute of Art. For the past twenty years he has been utilizing a variety of media from photography, video, painting, sculpture, performance and installation to investigate the emancipatory capacity of artistic expression both in the world and the brain. Recently his interests have turned to what he refers to as a neuroethics: the right of every individual on the planet earth to fully activate his or her neuroplastic potential. Neidich is currently working on two major artworks at this time. In Los Angeles he is the middle of The Hollywood Blacklist Project 2013-2018. A number of preliminary projects including Book Exchange, 2014 and Double Jeopardy, 2015 are intended to set the ground work for a major public work in 2017 called Re-imagining the Hollywood Walk of Fame. Florencia Portocarrero is a researcher, writer and independent curator. She obtained her BA in clinical psychology at the Pontifical Catholic University of Peru, where she also received her MA in Psychoanalytical Theory. During the 2012/2013 Portocarrero participated in de ‘Appel Curatorial Programme’ in Amsterdam and recently she completed a MA in Contemporary Art Theory at ‘Goldsmiths University’ in London, where she graduated with honors. Portocarrero regularly collaborates with the international contemporary art magazine Artishock and has contributed with her writings on art and culture in numerous catalogues and publications. In Lima Portocarrero is co-founder and co-director of the independent art space ‘Bisagra’ and works as public program curator at ‘Proyecto AMIL’. In the context of BAR module: Curating the space / Space for curating – the new flexible pedagogical format by BAR project – we are happy to invite you to the final BAR curator talk, a public conversation among Sofía Hernández Chong Cuy, Carles Guerra, Latitudes, Michy Marxuach and BAR module participants. The first BAR module: Curating the space / Space for curating highlights the research for a territory of curatorial expression. The program focus on providing a context for an intensive professional exchange about this very important issue on curatorial work nowadays. 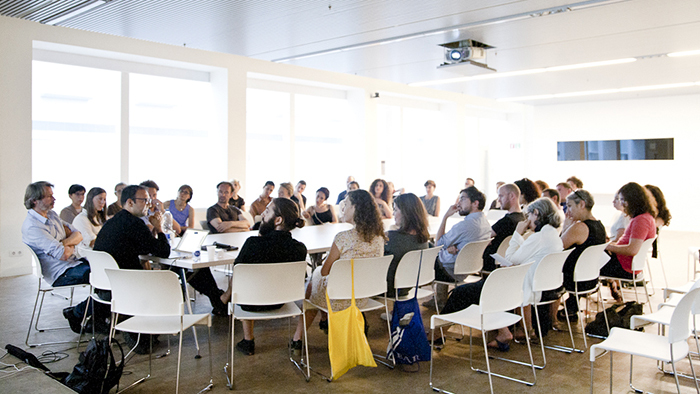 Seeking to create an intimate and informal learning environment, a group of participants gather international guest curators to think, question and develop ideas on curatorial practice over a period of a week. Following the modus operandi of BAR project, hospitality will be at the core of the program, generating an environment where knowledge transfer occurs from experience, conversation and action. The selected participants are: Alejandra Avilés, Cristina Albertini, Garazi Ansa, Francesca Boenzi, Pauline Bordaneil, Alba Folgado, Gris Garcia, Valentina Lacinio and Helena Perez. Writer in residence: Maja Ćirić. The program starts with The walking tour by BAR project in the city of Barcelona, a selection of guided visits to commercial, institutional and independent spaces, as well as meetings with local practitioners. The following days the program take place at Fabra i Coats – Barcelona Art Factory. Consisting in daily public lectures and conversations led by Chus Martínez (Head of the Institute of Art at the FHNW, Basel), Michy Marxuach (Co-founder of Beta-Local, San Juan, Puerto Rico), Sofía Hernández Chong Cuy (Curator of the Colección Patricia Phelps de Cisneros, New York), all participants have the opportunity to present their personal statements and points of view on the subject. Last day at Fabra i Coats will include a public talk among the guest curators, Carles Guerra (director Tàpies Foundation) and Latitudes (Max Andrews and Mariana Cánepa Luna, independent curators, Barcelona) together with the participants, followed by a cocktail party. The weekend will be devoted to studio visits with local artists around the city. The BAR module: Curating the space / Space for curating is generously hosted by Fabra i Coats – Barcelona Art Factory. We celebrated our second anniversary with you in a special day-time party. We danced, ate and drank. Artist and musician Natalia Sorzano (CO) – aka NIKA – presented a performance followed by a d-jay session during the afternoon on a stage in the garden. We would like to thank people, organizations, all the artists, agents and public for their generous support. Natalia Sorzano (Colombia, 1984) aka NIKA use multimedia to approach human social attachment to cultural imagery and collective faith. Exemplifying through fiction and music, she researches the relation between emotion and social and political histories. She graduated with degrees in Law and Fine Arts from Los Andes University in Bogotá, 2010. Currently enrolled in a Master Degree programme of Fine Arts at the Piet Zwart Institute in Rotterdam. Her most recent exhibitions were at Tale of a Tub and TENT, performing during Katarina Zdjelar´s book Launch “Toward a further word” (Rotterdam, 2014). Her work has been shown in spaces around Latin America, such as Proyectos Ultravioleta (Guatemala, 2010), Des Pecho (Costa Rica, 2011), Museo La ENE (Argentina, 2012), Salon Regional (Colombia, 2012) and La Otra Bogotá Biennial. Based on the different perspectives and positions of the visiting curators, this conversation will deal with their approaches to institutional and socially engaged artistic practices. Participants: Binna Choi is director of Casco, Office for Art, Design and Theory (Utrech, NL), Matteo Lucchetti is curator of the research and biennial award Visible project (Brussels, B) and Silvia Franceschini is independent curator and member of the curatorial team of the upcoming Kiev Biennale of Contemporary Art (Kiev, 2015). Introduced by Carles Guerra, this chapter reflect in the change between the analogical and the digital in the post-fordist labour scenario. The three films speculate, trough a futuristic esthetic, in different moments of this process, imagining future possibilities and rethinking the consequences on present time. The project’s stem from the notion of the terms [alienation and immigration] in geographical and historical context through North Africa [Morocco] and South of Europa [Spain], that established on Voltaire quote [Africa begins at the Pyrenees] that lead me to several questions about the political and cultural boundaries! Through the research I’m dealing with narrative as a source of information, from the literature and history and the storytelling. Through the Arab uprising several questions imposed on the dilemma about the identity of the Arab culture and its relation to Western counterpart, in the same time there is new contemporary theses dealing with dismantling Culture, and the death of National treatises, that drives me to search geographically on two places that can reflect certain phases of historical and geographical relation. The starting point of the research is Voltaire’s quote [Africa begins at Pyrenees] courge me to reexamine the Spanish literatures that contains African and Arab gesture such as Juan Guitsolo and Frderic Garsia Lorca. In context of historical mixture culture I’m trying to find the blended culture of the *Aljemiado manuscript, and even try to examine my personal experience through the traveling between two places. In order to memorize well, one must pay special attention to what is going on. As a unique human capacity, narrative memory consists of mental constructions which people employ to make use of experience. Mohamed Abdelkarim collects different stories from Spain and Morocco, which deal with the notion of alienation and immigration in a specific geographical and historical context: the Mediterranean area. Through the Arab uprising, several questions surface on the dilemma about the identity of the Arab culture and its relation to Western counterpart. At the same time, culture is being dismantelled, and the death of national treatises drives him to search geographically on two places that can reflect certain phases of this relation. Mixing fiction and real stories, Possibilities of Telling a Story, Christopher Columbus meets Diego Diaz is a storytelling performance developed through improvisation, using different materials produced during the residencies in Dar Al Ma’mun (Marrakech) and BAR project (Barcelona). Vídeos, photographs, objects and prints will build a new story in relation with the words, the space, the public and the artist´s personal experience through the traveling between two places. Wednesday, May 14th, Bar Olimpic (Joaquin Costa 25B), Barcelone BAR project’s talk among residents Mohamed Abdelkarim, Eduardo Navarro and Angela Serino and BAR project team project in the Olimpic bar. We will adress, in an informal and friendly environment, many issues arising from the proposed residences, their work in the city, common interests, or other ways of working that may crop up in the conversation. We invite anyone you feel like to participate and join us. Activity of Jugada a 3 Bandas.